Teenage Hair Removal NYC – Waxing for girls in New York City. Teenage Hair Removal NYC.Teens Hair Removal NYC.Brazilian wax for girls.Brazilian Waxing for teen.New York Brazilian wax teenagers. Dyanna Spa in Manhattan offers safe and healthy New York wax treatments for teens, because they understand that positive self-esteem for maturing girls is extremely important. Some people are critical about girls waxing, believing it to be too much too soon; however, nothing could be further from the truth.Adolescent children are very much aware of what they look like and are extremely sensitive about it. Parents who are aware of this can help them shape a positive self-image, one of confidence and self-acceptance. Nonetheless, that’s hard to accomplish if a girl doesn’t like the way she looks. After all, what female tween or teenager wants a dark moustache, a hairy back, or a unibrow? Some girls with excess hair do get laughed at or bullied.Whether hair comes from burgeoning hormones or from ethnic backgrounds, it is still unwanted hair when it grows in the wrong places. Dyanna Spa in NYC recommends waxing as the best hair removal treatment for teens and tweens. Shaving can result in cuts, nicks, ingrown hairs, coarse stubbles, and irritated skin — plus the hair grows back after a couple of days. Waxing removes hair from the roots, not at the surface, and with every treatment, hair grows back thinner and finer. Additionally, waxing lasts from four to six weeks. There are waxing treatments for almost any part of the body including legs, arms, underarms, upper lip, eyebrows, back, chin, facial cheeks, nose, toes, and ears. There are certain age restrictions, however. No one under twelve years of age can receive waxing services, and any girl under the age of sixteen who wants a regular bikini waxing or a Brazilian wax must have their mother present. Certain procedures must be followed upon arrival and personnel will consult with the parent to discuss the specifics of the wax treatment. Dyanna Spa uses two types of wax: Azulene and Cirepil Blue Hard wax. The Azulene wax formula is safe and effective on most areas, while the Cirepil Blue is used on more sensitive parts of the body or on people who have sensitive skin. When using Azulene wax, the esthetician gently applies hot wax (but not too hot) to the area, covers the wax with paper strips, and then quickly removes the paper along with the unwanted hair. With Cirepil Blue, the cosmetologist applies warm wax to the desired area and once it hardens, she peels off the wax with the excess hair. Dyanna Spa adheres to a strict “no double dipping” policy for the health and well-being of all clients. The esthetician throws away the spatula used to apply the wax after each single dip into the wax, and uses a new one for the next dip. This prevents germs from getting into the wax and spreading any harmful bacteria to another person. Waxing is not about girls wanting to grow up too fast. Most girls just want to feel good about themselves. There is no need for them to be embarrassed about visible hair growth as long as they use beauty salon waxing services that are reputable and sanitary. Waxing can boost their self-esteem and give them confidence to be seen and heard out in the world. Dyanna Spa has won “Best New York Salon for Waxing” and “Best New York Salon for Hair Removal” from such high-ranking sites as Citysearch several years in a row, so you can rest assured that tweens and teens receive the best and safest waxing services in town. Contact us now to schedule an appointment for a waxing treatment for your young lady. Massages in New York massages in Manhattan.Massage Salon in Manhattan NYC.Massage for men in Manhattan. One of the best ways to take care of yourself is to get one of Dyanna Spa’s relaxing and healing massages in Manhattan, New York. Renowned for their award-winning day spa including “Best New York Spa for Massage”, Dyanna Spa offers a host of affordable massages for both men and women that will de-stress and rejuvenate you. Take advantage of one of these fabulous body massages to erase away the cares of the day. Swedish Massage: Our Swedish massage therapist will knead out all those tension-caused knots, improving blood flow while releasing toxins that build up in your muscles. Treatment is only $120.00 for a full 90 minutes. Deep Tissue Massage: Dyanna Spa’s massage therapist goes deep into the muscles where so much of our tension is buried, from either sports, or just everyday life. Treatment is $130.00 for 90 minutes of stress-relieving joy. Fusion Massage: This extraordinary massage combines deep tissue, Swedish, and reflexology techniques. All three techniques work to rid the body of toxins, aches and pains, and tension. You’ll be a new person after our masseuse finishes this wonderful massage treatment. Treatment is $130.00 for 90 minutes of relaxation and healing. Reflexology Massage: Reflexology massage manipulates pressure at various points in your hands and feet to alleviate tension, aches, and pains throughout your body. These reflex points relate to specific organs and glands in the body and when stimulated, promote bodily health. Our certified NY massage therapists will have you feeling like new again. Treatment is $50.00 for 30 minutes. Hot Stone Massage: Our massage therapist places heated basalt tones upon specific points on your back to relax and improve the flow of energy throughout your body. Treatment is only $85.00 for a 60-minute relaxation session. Aromatherapy Massage: Our magic touch aromatherapy massage involves rubbing and kneading the skin with plant oils. These wonderfully scented oils not only have a pleasant aroma, but they promote relaxation, well-being, and healing as well. Treatment is $80.00 for 60 minutes. Lymph Drainage Massage: Lymph Drainage Massage pinpoints the lymph nodes and stimulates the lymphatic system to circulate necessary lymph fluids through the body. A well functioning lymphatic system helps remove toxins from healthy cells and helps fight cells attacked by viruses. Treatment is $100.00 for 60 minutes of bliss. Reiki Massage: Trained Reiki massage therapists use their hands to channel energy from the universe to the body so that the body can heal itself. This Japanese-based massage technique promotes healing by destroying blockages and detoxifying the system. Treatment is $85.00 for a 60-minute treatment. Massage treatment times vary so please call us or visit website for prices. Massages aren’t just for pampering, although it’s hard not to feel pampered. Massage therapy is known for its healing properties by reducing stress that is harmful to the health of your body. Call it what you will – pampering or indulging. It’s still a way to stay energetic and healthy in both mind and body. Contact us now to schedule an appointment for one of our affordable spa massages in Manhattan, New York. Celebrate your independence and take advantage of one of the best of N.Y. spas’ July specials, offered exclusively by Dyanna Spa in Manhattan. Our clientele are among those who stand independently and who are always on the cutting edge of what is new and fashionable. They know how to take care of and present themselves in the most positive way. Welcome to their place, Dyanna Spa, the leader of personal well-being and style. Ninety Minutes – Regularly $72.00 – Special $50.00 – Save $22.00! Our hands and feet sustain a great deal of physical stress, so it’s important to take good care of them. Black currants are renowned for their high content in Vitamin C (a powerful antioxidant), GLA (Gamma-Linoleic Acid, a very rare Omega-6 essential fatty acid), and potassium. They contain twice the potassium of bananas, four times the vitamin C of oranges, and twice the antioxidants of blueberries. Our Black Currant spa manicure and pedicure combo works wonders for relieving stress in your hands and feet, leaving these over-used extremities infused with natural anti-aging properties. Add to this, a luxurious paraffin heel bath that will moisturize even the most callused feet, and you will leave our day spa feeling like a million bucks. Sixty Minutes – Regularly $100.00 – Special $75.00 — Save $35.00! Microdermabrasion treatments exfoliate, resurface, and promote new facial skin cells for a younger, clearer complexion. Paired with our collagen mask, which hydrates and improves the skin’s elasticity, you will receive one of the most highly regarded anti-aging treatments. Seventy-five Minutes – Regularly $47.00 – Special $35.00 – Save 25%! A Jelly Pedicure is a marvelous, innovative footbath treatment for tired feet made from a special blend of essential plant oils including the extracts of aloe vera and ginseng. When added to hot water, the powdered ingredients produce a lightly aromatic gelatinous mixture, which retains the heated water temperature up to four times longer than just hot water. Your feet benefit enormously from soaking in this healing mixture. This special includes a regular manicure – which is anything but regular. Prior to shaping and buffing your nails, we use a special hot cream, European Lactol, to moisturize your hands and strengthen your nails. Then your cuticles are soaked, and cut or pushed back to lengthen the nail bed. If you want your nails polished, we apply a base coat before applying the polish of your choice, followed by a long-lasting top coat. For a full, gentle, and natural exfoliation of the body, try our Pomegranate Red-Apple Full Body Scrub body treatment. We use the purest cane sugar combined with potent antioxidants derived from organic red apple juice and pomegranate juice. After this treatment, your skin will be deliciously smooth and delectably radiant. Ninety minutes – Regularly $50.00 – Save $10.00! Our tropically inspired Sweet Green Tea and Silver Birch Spa Pedicure will have your hands and feet soaking in calming, green tea extracts, and nutritional anti-oxidants. This treatment will revitalize your dry skin and restore lost vitamins and minerals while you breathe in the relaxing aroma of birchwood. Dyanna beauty spa is also extending our June men’s waxing special. If you spend more than $60.00 on our waxing services, you will receive a free underarm wax treatment, which normally costs $20.00. So assert your independence and be a model to others about how to take care of yourself and how you choose to look. Schedule an appointment now for our July spa specials at the best New York spa in Manhattan. Dyanna Spa ! With summer time right around the corner, Dyanna Spa, the acclaimed New York day spa, recommends five top summer skin care tips so you can look your best. It’s important to learn about how to best care for your skin now – not after the sun does its damage. We all know that too much sun can cause many skin problems – from drying, sunburns, liver spots and premature aging to skin cancer. If you will follow these simple skin care tips, you won’t have to worry about the negative effects of the sun. In addition, you will learn how to make your summer appearance even more beautiful. Use sunscreen, but not just any sunscreen. The Food and Drug Administration (FDA) has important new guidelines about what is safe and unsafe in sunscreen products. Do not use a sunscreen that has retinyl palmitate, PABA, oxybenzone, helioplex, or dioxybenzone. It is safe to use any sunscreen that has zinc oxide and titanium dioxide as its ingredients, with a SPF of 15 or higher. SPF of 15 blocks 93% of damaging UVB rays and SPF 50 blocks 98 percent. Reapply often. Moisturize, moisturize, moisturize! The sun’s drying effect on skin is notorious. Use a good alcohol-free moisturizer on your face and body several times a day. 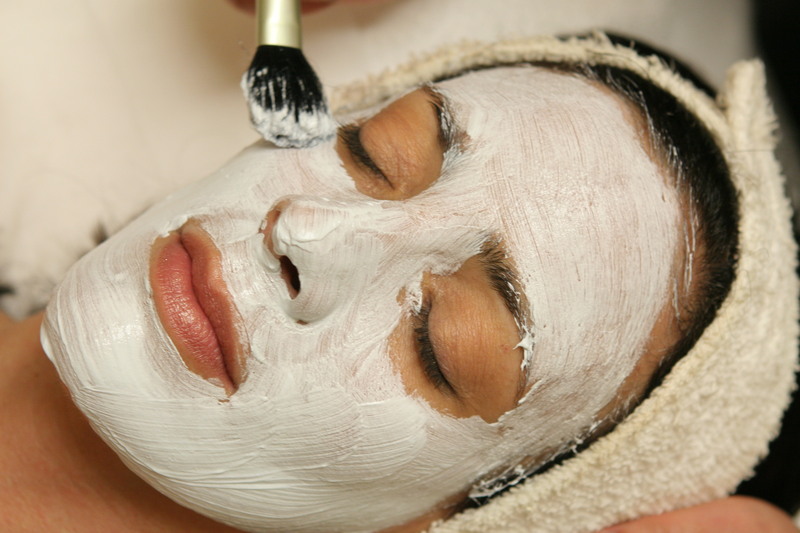 Dyanna Spa has a roster of facials to help you maintain or regain the moisture in your facial skin. Our Sheep Placenta Facial is fantastic for diminishing sun damage, wrinkles, and fine lines. If you have sensitive skin, our Hydra 4 for Sensitive Skin Facial byRepechage will help your skin retain moisture and build resistance to environmental factors. In order for healthy new skin cells to develop maximally, you must get rid of the dead skin cells through exfoliation. Our day spa has exfoliation treatments from head to foot. Starting at the head, try our Peeling Facial. This deep exfoliation method uses vegetable and fruit enzymes that remove all dead skin cells, giving you a more youthful appearance immediately. For the feet, our Jelly Pedicure is a great foot care treatment as it hydrates and exfoliates your feet to the max. Wearing bathing suits, tank tops, and shorts means hair in unwanted places needs removal more often. If you are shaving, you are prey to nicks, cuts, bumps, redness, and irritation. Instead of using a razor, try wax treatments. Waxing will eliminate all of the skin problems associated with shaving. Check out all of the incredible hair removal treatments we offer including treatments for the face, back, arms, chest, legs, and toes. 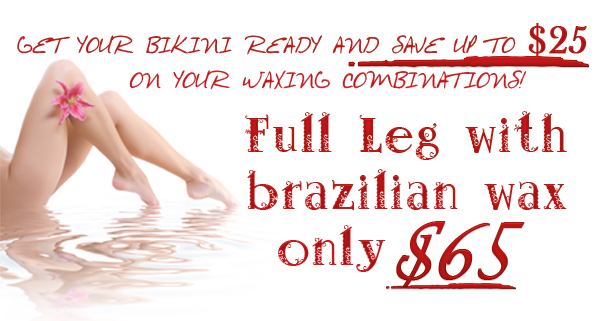 You may also be interested in our bikini wax services, as well as our renowned Brazilian Bikini Wax process. Talking about bathing suits and shorts may make you think about the dimply image of skin blighted by cellulite. Our beauty spa’s Anti-Cellulite treatment will have your body looking slimmer and smoother with just a few treatments. You’ll get a massage that improves circulation and ultimately eliminates fluids between the fat cells. A wrap in which your body will sweat out additional excess fluids between fat tissues follows the massage. Just follow these skin care tips for healthy and attractive skin, and you’ll love the way you look…and all you men out there…these tips are not just for women! Our male clientele love our Manhattan spa and you will too. Contact us now to schedule an appointment. When you arrive, you will consult with one of our professional estheticians who will advise you on the very best treatments for your particular skin and body type. Massage Salon in Manhattan New York! A new contour shaping massage that sculpts your body and helps shed body fat is now available at Dyanna’s, our New York City day spa. The massage, which smoothes your skin by breaking down the fatty tissue or cellulite in your body, is non-invasive, non-surgical, and completely natural. You will be able to see visible results after several massage sessions. What is a Contour Shaping Massage? A contour shaping massage is a specialized body treatment that uses a variety of massage techniques and strokes to break down the fatty tissues and adhesions under the skin that give a lumpy appearance to certain parts of the body. Under the skillful hands of our specially trained masseuse, you will experience positive body changes over a period of several treatments as the fatty tissue is broken up and smoothed out. What parts of the body does the massage target? The Contour shaping massage targets three main areas of the body. As a result of this special massage treatment, you can expect improved circulation, cellulite reduction, improved posture, contoured dimension loss, smoother skin tone, better circulation, and diminished facial wrinkles. What are the benefits of the Contour Shaping Massage? There are many healthy benefits of the Contour Shaping Massage. It acts as an anti-aging treatment as your body becomes leaner and younger looking. It helps drain toxins from the lymphatic system where they collect. It smoothes out the lumpy skin appearance in particular areas of your body. It tones and lifts sagging skin. It enhances your self image. Is the Contour Shaping Massage for everyone? It is important to know that the Contour Shaping Massage is not a massage for relaxation and stress reduction. Rather, it is an aggressive massage, which can sometimes be painful as our masseuse applies strokes deeply into fatty tissue to break it up. Although it is a very safe treatment, if you have any medical conditions, please be sure and tell us when you call to make an appointment. Take advantage of our 25% June Special for our Manhattan beauty spa’s new Contour Shaping Massage. Dyanna Spa is the day spa to receive the best professional spa services in N.Y.C. Contact us now to schedule an appointment for the latest in our N.Y.C. massage treatments. Dyanna Spa in New York City has some great tips for reducing wrinkles and unflattering dark circles under your eyes. The Manhattan day spa also suggest some neck and eye treatments that will help you look your very best. No one wants to look older than they are, and just about everyone wants to look as young as they can. If you have fine lines and wrinkles on your neck and around your eyes, and darks circles and bags under your eyes, you are not going to feel as confident as you should about your looks. Some of the unwanted signs of aging appear due to genetics; others are due to stress, the environment, the normal aging process, a poor diet, sleep deprivation, or health problems. Although there is no magic wand that removes the dreaded “turkey neck”, fine lines, wrinkles, dark circles and bags under your eyes, there are some things you can do to reduce the appearance of aging without having to resort to expensive and complicated cosmetic surgery. If you want to get rid of those uncomplimentary dark circles and bags under your eyes, or those annoying fine lines and wrinkles around your eyes, lovingly known as “crows’ feet”, then you are going to have to make some lifestyle changes. Any esthetician worth his or her salt will tell you this. For you to look your youngest and your best there are some common sense tips that will help you accomplish this. Don’t give it up to the sun! Never, never go outside without sunscreen on your face, neck, hands, and any other body part that is not covered up, and if it doesn’t destroy your outfit, wear a hat. Those unwelcome crows feet around the eyes evolves from years of laughing, smiling, and squinting. To prevent further environmental damage to your eyes, and to prevent squinting, be sure to wear 100 percent UV protective sunglasses when you go outdoors. Besides, everyone knows sunglasses make you look more glamorous. Stay away from overly salty foods and alcohol. Because the skin around the eyes and the eyelids is very thin, fluid retention there is noticeable, making your eyes look puffy and making you look tired. As we age, our eyelids thin, and blood vessels are visible through the skin. This imparts a bluish cast to the eye area. Avoid using dark eye shadow, as it will cast an even darker look to your eyelids. Using lighter shades will brighten up your eyes and make you look younger. Unfortunately, a lot of the aging that occurs to the eyes is genetic; however, if you use a creamy concealer that is a shade lighter than your skin tone, you can disguise the dark circles and bags under your eyes. Diminished levels of collagen and elasticity are a natural part of the aging skin process. Because neck skin is thinner, less elastic, and has fewer pores than facial skin, it is difficult to prevent sagging neck, fine lines, and wrinkles from making their appearance. This is all the more reason to have a special skin care plan for your neck. As with the eyes, always apply sunscreen before you go outdoors to avoid sun damage to the neck. If you sleep on your side, try changing your habit to sleeping on your back. This will help creases in your neck from developing and then sagging. The body produces protein for cell repair while you sleep, including cell damage created by sun exposure and pollution. Getting enough sleep can also produce more human growth hormone (HGH), which is essential for skin elasticity. If you don’t want sagging neck skin and wrinkles, get at least 8 hours of sleep. Make sure you include your neck in your moisturizing regimen. Many people don’t realize that your neck needs as much beauty attention as your face. Eat sensibly. A low saturated fat diet, with fresh fruit and veggies, adds a great deal to your skin care regimen. It will keep you looking younger, longer. Dyanna Spa in N.Y.C. has two excellent restorative eye treatments that can help reduce those pesky aging signs. Collagen Eye Treatment: For only $15.00, our Collagen Eye Treatment will help reduce those fine lines and wrinkles around your eyes. Our esthetician will apply a collagen mask under and around your eyes. The mask nourishes and hydrates the skin, while treating the area with collagen for more skin elasticity. After this eye treatment, the skin around your eyes will be tighter and your eyes will look less puffy. You will leave looking younger than when you walked into our beauty salon. Opti Firm Eye Contour Treatment by Repechage: The clinically proven Repechage eye treatment will reduce the signs of sleep deprivation, aging, and sun damage. In only fifteen-minutes, you will see for yourself how wonderfully this treatment works. Repechage’s formula includes the natural extracts of Ginkgo Biloba, Gutu Kola, firming Aosa Seaweed, special enzymes, and more, which work to reduce wrinkles, puffiness, and dark circles. The low cost of $20.00 is hard to beat. Remember not to forget skin care for your neck if you want to reduce the signs of aging. We guarantee you’ll be pleased with your appearance after our neck treatment. Neck Firming Treatment: Our Neck Firming treatment targets the area of your neck from below the chin line to the shoulders and is great for loose or sagging skin. Costing only $15.00, our special “Neck Lift Collagen Crystal Mask” adds elasticity and firmness to your neck, reducing fine lines and wrinkles, and helping to restore the youthful contour of your face. Why spend thousands of dollars for cosmetic surgery when you can get a lift with Dyanna Spa’s special neck and eye treatments for only a few dollars? The treatments are effective and the results, unlike plastic surgery, are absolutely painless. Our eye and neck treatments are a great addition to our rejuvenating facials, so be sure to include them when you schedule an appointment. The next time you look into the mirror and want to change what you see, give us a call, or visit our website. A more youthful you is just minutes away. Manhattan’s Dyanna Spa Beauty Survival Guide for fall and winter is just the thing you need to get rid of the holiday and winter blues. Studies have shown that cold weather, N.Y.C. traffic, and big city shopping crowds, causes people to get stressed out, de-energized, and depressed. With all the holiday parties, there is also a tendency to imbibe in alcohol and eat more than usual. Morale and skin can both take a beating. There are things you can do to ensure that you and your skin survive the holiday season intact. Be aware of how much you are eating and drinking. No one wants to be a party pooper, but just pull back a bit. It never feels good to wake up the next morning after overdoing it. Take a nice warm shower in the mornings. Make sure not to make the water too hot or else the water will dry out your skin instead of hydrating it. Make sure to use a good hair conditioner because cold weather can dry out your hair and scalp. Immediately after drying off from your shower, apply moisturizer to your face and body (preferably one with SPF30) while the pores of your skin are still open. This allows the moisturizer to penetrate much more deeply into your skin. Limit the use of a hair dryer as it will dry your hair out even more than the cold weather will. Don’t forget your lips. Chapped lips hurt and are not exactly attractive. Moisturize with a lip balm that contains jojoba oil or other moisturizing oils as part of your morning regimen. Use your lip balm throughout the day and be sure to apply it before you go out into the cold. Exfoliate your face and body at least two times a week to get rid of all the dead skin cells. This will allow the skin to absorb your moisturizer more efficiently. Avoid rough red hands and protect them from the cold by frequently using a good hand moisturizer throughout the day and wearing mittens or gloves outdoors. Before bedtime, and after bathing or just washing your face, be sure to moisturize again. Get plenty of restful sleep. With a rested mind and body, you’ll be ready to conquer the world (or at least New York City). Our spa treatments can help you remain looking radiant and staying relaxed even in the harshest weather and most stressful times. The following are a few of the best treatments for this time of year. What could possibly feel better on a bleak chilly day than a Hot Stone Massage? Our massage therapists use heated basalt stones, which have excellent absorbent and heat retention qualities. The stones are place on your back on specific points of your spine to relax and improve your body’s energy flow. This wonderful stress relieving massage will energize and rejuvenate you and it only costs $85.00 for a full hour. It’s great for both men and women. The European Facial for men and women is a super facial because it is perfect for all skin types. For one whole hour and for only $75.00, you will relax while our esthetician completely cleanses your face, exfoliating and clearing out any clogged pores. A mask and moisturizing treatment follows the cleansing process. The European Facial will rehydrate your skin and have you feeling happier and looking younger than when you walked into our day spa. Let us help keep you feeling good and looking good during the holiday season. Call Dyanna Spa and Nail Salon now and make an appointment. We’ll pamper you to your heart’s content. Keep up with Dyanna Spa NYC news, specials, and promotions. Become a fan on FACEBOOK, and follow us on TWITTER.